Do you live, work, shop or play in Pleasure Point? 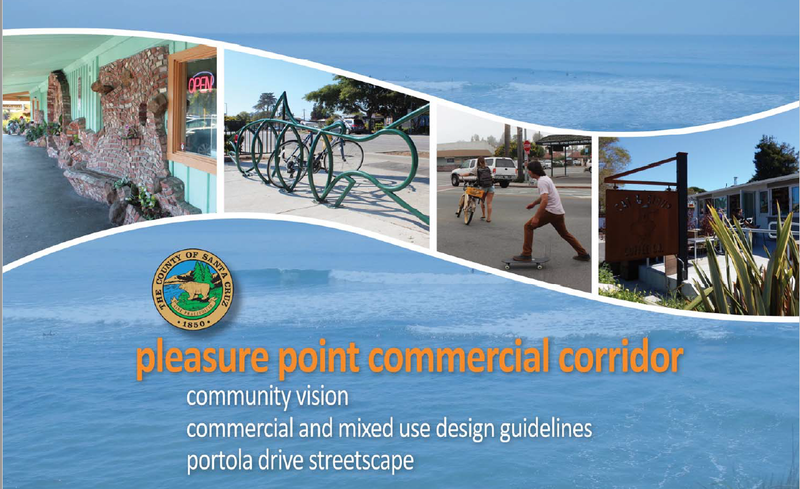 Please join us in developing a community-based vision and design guidelines for the Commercial Corridor in Pleasure Point, and a concept for streetscape improvements along Portola Drive! Pleasure Point has a unique character and strong community identity. In 2008, the community and the County developed the Pleasure Point Community Plan for the residential area of Pleasure Point that reflects the community vision and distinctive character of Pleasure Point neighborhoods. The County is now working with the community to develop a Vision, Guiding Principles and Design Guidelines for the commercial area along Portola Drive. In addition, a conceptual plan will be developed for the Portola Drive streetscape with potential improvements to the public right-of-way to benefit all users, including pedestrians and bicyclists, local business owners and residents. The Pleasure Point Commercial Corridor includes Portola Drive between 26th Avenue and 41st Avenue, and the commercial properties along this corridor. Thank you for visiting, and we hope to see you at a Community Workshop!